When there are estate and family disputes, seemingly simple matters can quickly become complex and potentially more difficult to resolve. The legal rights and/or obligations of the parties, the nature and value of assets in issue, countervailing claims, personal issues, and a myriad of administrative and procedural details can together seem overwhelming. 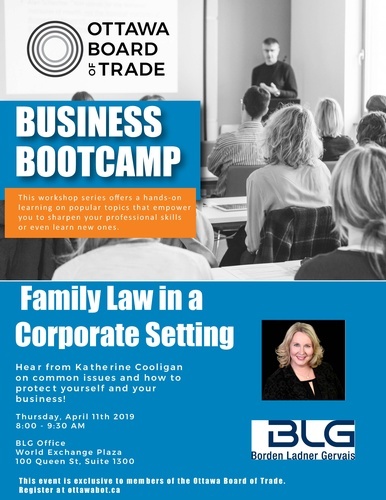 Katherine Cooligan will present on some of the more common issues and how to protect yourself and your business from single issues to more complex matters. Katherine Cooligan is the Regional Managing Partner of the Ottawa office. She is the Chair of the Regional Management Committee and also the Regional Leader of the Estates and Family Law Group. Katherine is a specialist in family law as certified by the Law Society of Ontario. Want to learn more about business fundamentals? This Board of Trade workshop series offers a hands-on learning experience for attendees on popular topics that empower you to sharpen your professional skills or even learn new skills, while growing your business. This is a complimentary event for Business Associate members or higher and is exclusive to members of the Ottawa Board of Trade.